This custom, complete Cimarron Sports batting cage features a 70 ft long x 15.5 ft wide x 12 ft high commercial batting cage and either a 12 foot wide or 14 foot wide net in your choice of net strength. Choose from residential #24, light commercial use #36 or heavy duty commercial use #42 nets. 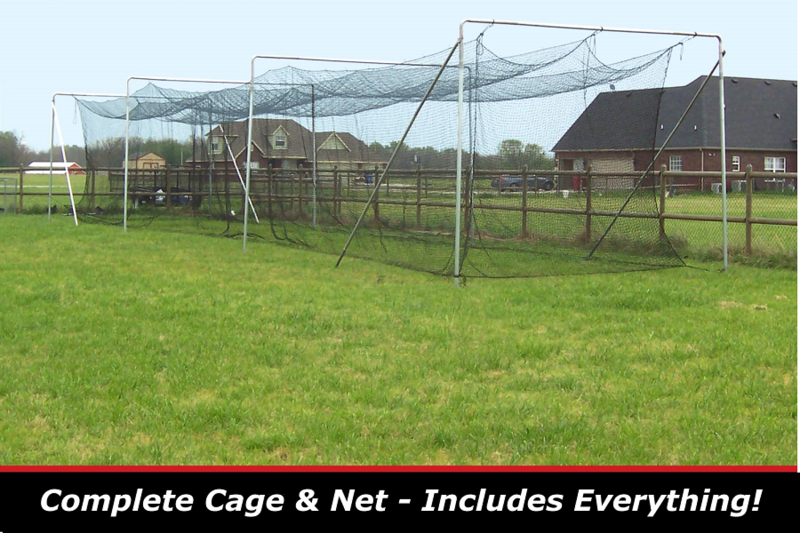 Unlike most other batting cages on this website, this 70 foot complete commercial batting cage is not portable. It is designed to be cemented permanently to the ground. It includes the nets, hangers, support ropes, metal corners, ground sleeves and all of the steel pipes - everything you need to set up a real, super long lasting batting cage. The ground sleeves are concreted into the ground to provide strength and there are arch supports at each end of the frame to make the frame rigid. Elbows and ground sleeves are made in America and are 14 gauge 2 1/4"steel. Most steel poles that come from China are 18 gauge and much weaker. The batting cage hangs inside the frame to prevent balls from hitting a frame pole and ricocheting back and hurting someone. We do not recommend hanging a batting cage over the frame.The frame has arches with three strong cables going the length of the frame to support the batting cage. Two Year Warranty on the net. THE CIMARRON GUARANTEE: Cimarron Sports guarantees 100% satisfaction with your 70' x 14' x 12' Batting Cage. Products may be returned for a refund within 31 days of the date the product was shipped to you, when returned in accordance with the Cimarron Sports policies outlined in the Shipping & Returns section of this website. WARRANTY: Cimarron Sports warranties this cage with a 1-year limited warranty against manufacturing, materials and workmanship defects (the net carries a 2 year warranty). We will enthusiastically replace or repair your product at our discretion. For full details, please read the Cimarron Sports section of the Shipping & Returns page. No matter where you order a Cimarron 70 foot Batting Cage from, NOBODY actually stocks them; they all ship directly from the manufacturer's warehouse located in Tulsa, Oklahoma. Therefore, the shipping time frame is exactly the same no matter what website you order from (we hope that it is this one!). Cimarron 70 foot cages typically take 2-4 business days to ship from the time you place your order. They typically ship via Federal Express (FedEx) or UPS Ground and could take anywhere from a day or two to a week to get to you AFTER being shipped, depending on your proximity to their warehouse. We will notify you of your tracking number the moment we receive it from the manufacturer's warehouse. Click here to download an easy to read, printable PDF of the Cimarron 70x15.5x12 Complete Commercial Batting Cage Frame & Net Owner's Manual.